Apple hardware problems – if you’ve purchased a computer from the bookstore and it is still under warranty (or Applecare coverage), you can visit any Apple Store for repairs (best to make a reservation at the “Genius Bar”). Other hardware problems – If you purchased from the bookstore, contact them directly. The bookstore works with various repair vendors that will take repairs on contract. Otherwise, contact the vendor from where you purchased the computer. For all other issues, please use our Computing Support Request form. Guests may use the "UCSD-Guest" WIFI for web, ssh and secure e-mail applications. Select the "UCSD-Guest" from your wireless device, open a web browser and agree to the terms. For more information on the Guest WIFI, see Using Wireless as a Guest at UC San Diego. Hardwired ethernet is available in the CPMC, WLH and Mandeville buildings. To access this, your device must be registered. To ensure that we have all of the information to register your device, please fill out a Computer Support request. Note that registration can take up to 2 business days to complete. Once registered, your desktop computer or laptop can be configured for DHCP. If your computer receives a dynamic IP address which appears as 172.16.x.x, then your computer is not properly registered. You will, however, be able to access UCSD resources (such as on-campus web and e-mail servers). As part of the Next Generation Network at UCSD, computers in UCSD offices or labs may connect to the UCSD network and the Internet. Users must follow UCSD usage policies in order to retain connection privileges. All computers connecting to the UCSD network must be registered. You can register your computer yourself through the Network Operations EtherForm. You will need to specify the subnet. The Department of Music supports ethernet to all Faculty, Staff and Graduate student offices. Most offices have active ethernet. If you need for an ethernet port to be activated, please fill out a Computer Support request. In addition to the traditional wired Ethernet, Network Operations and ACT have deployed a wireless network in many public locations throughout the UCSD campus. “MUSIC” – Linux e-mail, mail lists, web and SQL database server. “MUSICBIZ” – Mac OS X fileserver, Filemaker Server, and calendar server. E-mail – All @music.ucsd.edu addresses and mail lists are served from within the department. Web – The Instructional WWW Developement Center supports all web for instruction. They support WebCT as well as web space for courses. Faculty and TAs are encouraged to use WebCT and it provides a standard look, automatic links into campus directories and the potential for a history of course information from one year the next.If WebCT does not suffice, IWDC can also provide plain-old web space. If IWDC’s services are not sufficient, contact support@music.ucsd.edu for access to departmental resources.Faculty, Staff and research organizations can post web content on the music.ucsd.edu. The URL will appear in the form of http://music.ucsd.edu/~username. To obtain space on the music server, fill out the Computer Support request form. You will receive account information which will give you FTP access to the web server. If you have unique web requirements or require assistance with building your web pages, contact UCSD’sIWDC. To change your server passwords, contact support@music.ucsd.edu. The Music Department does not maintain any library of “extra” software licenses. For the most part, the best deals will be through the campus bookstore. UCSD has site license discounts on some software (including Microsoft Office, Filemaker and Eudora for Mac OS9, Mac OSX and Windows). view the Software Distribution website and fill out a Computing Support Form to purchase electronic versions of these packages or to request software for any of the computers in the studios. The Department of Music administrative file servers are backed-up and scanned for viruses on a regular basic. Store important files on the file servers. The “Users” folder (on Mac OSX) are backed-up on staff Macs weekly. While the department does not, currently, support regular backups of Faculty or research computers desktops or laptops, the computer support staff can assist with installation of backup devices and one-time archives to CD or DVD. At the beginning of each academic year, we purchased a large batch of external hard disks to help with your backups. If you would like like a disk or other backup assistance, fill out a Computer Support Request. File service – centralized file storage which is regularly backed up. Web – The Instructional WWW Developement Center supports all web for instruction. They support WebCT as well as web space for courses. Faculty and TAs are encouraged to use WebCT and it provides a standard look, automatic links into campus directories and the potential for a history of course information from one year the next.If WebCT does not suffice, IWDC can also provide plain-old web space. If IWDC’s services are not sufficient, contact support@music.ucsd.edu for access to departmental resources. Faculty, Staff and research organizations can post web content on the music.ucsd.edu. The URL will appear in the form of http://music.ucsd.edu/~username. To obtain space on the music server, fill out the Computer Support request form. You will receive account information which will give you FTP access to the web server. If you have unique web requirements or require assistance with building your web pages, contact UCSD’sIWDC. Faculty, Staff and research organizations can post web content on the music.ucsd.edu. The URL will appear in the form of http://music.ucsd.edu/~username. To obtain space on the music server, fill out theComputer Support request form. You will receive account information which will give you FTP access to the web server. If you have unique web requirements or require assistance with building your web pages, contact UCSD’sIWDC. Graduate students should use “iMusic1.ucsd.edu” for web service (Contact ACS for information on that server). Departmental printing is supported for Mac OSX, Windows and Linux systems for Faculty and Staff to the printer in the Mail Room or in the WLH printer closet. The department also supports 5 staff printers – one of which is color. Printing for Graduate instructional work is supported by a large-format HP 700 series printer in the WLH Graduate Work Room (WLH 2141) and a low-volume HP 400 series printer in the Graduate mail room. Graduate students should see the staff for printer supplies. Faculty, Staff and Graduate students may print PDF files from USB sticks using the Xerox Workcentre in the CPMC work room. If you are printing multiple copies (especially in color), consider using Imprints – the quality is better and and the cost is less. Undergraduate students should use ETS resources for printing (Pepper Canyon and the Price Center are the closest). If not, click on the “IP” icon at the top. 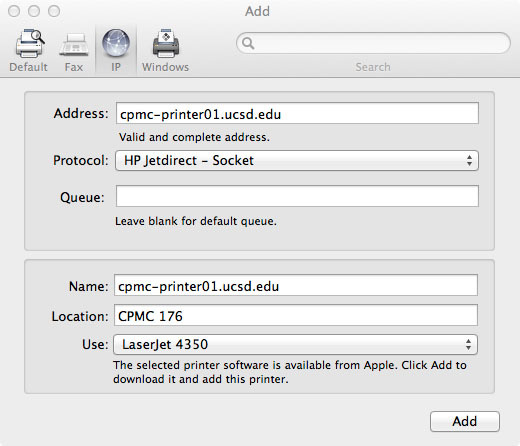 Enter “cpmc-printer01.ucsd.edu” in the “Address” field and “HP Jetdirect – Socket” in the “Protocol field. Then click the “Add” button. 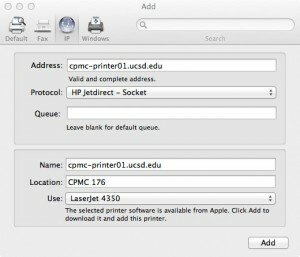 Contact support@music.ucsd.edu for printer configuration information. As of 2009, facilities for scanning are not provided by the Department.